» Can You Get Cold Sores on the Chin? Do I Really Have a Cold Sore on the Chin? Do I Definitely Have a Cold Sore? Can I Hide a Cold Sore on the Chin? What Are the Best Treatments & Remedies? While most cold sores appear on the mouth or lip, they can spread to other areas of the face. Some of the most common spots when they do include the cheek, the corners of the mouth, or the chin. A cold sore on the chin might appear to be another type of condition or growth. So, it’s important to know the signs. Thankfully, no matter where you get a blister, they can be treated fairly similarly. The chin may be a more noticeable spot. So, an oozing blister could be more embarrassing. There are ways to cover a cold sore to make the open sore less obvious. Facial cold sores are caused by the same virus, the herpes simplex virus. The difference between this location and a blister on the lip/mouth is that it typically doesn’t start there. When a blister ends up elsewhere on the body, it’s usually because of spreading. Spreading is one of the dangers for someone who has an active herpes virus and is experiencing a flare-up. It can cause multiple issues, more pain, and embarrassment. A cold sore on the chin is an example of just how contagious this virus can be. Not only can you experience cold sores on your chin, but they can be pretty unsightly. This article will focus on how most people get facial herpes. We will also look at ways to avoid spreading, how to tell the difference between a cold sore and a pimple, and a few ways to treat the problem. 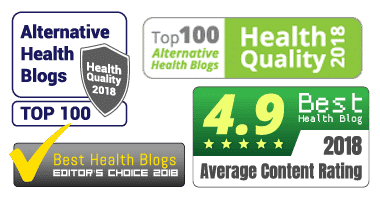 How Did I become Infected with HSV-1? Cold sores usually form on the lip or around the mouth. It’s very rare to experience a flare-up directly on the chin without it being spread from somewhere else. However, it’s also very easy for that spreading to occur. A cold sore on the chin is usually caused by an outbreak that started at the mouth. Consider how many times a day you touch your face. It’s that touching that can easily spread the herpes simplex virus. Additionally, cold sores can be itchy and irritating. If you scratch a cold sore around the lip area, and later touch your chin (or any other part of your face), you risk spreading the virus. Sometimes, you may be touching the affected area without even realizing it. This can occur in the early stages of a cold sore. Keep in mind that they are contagious at any stage. 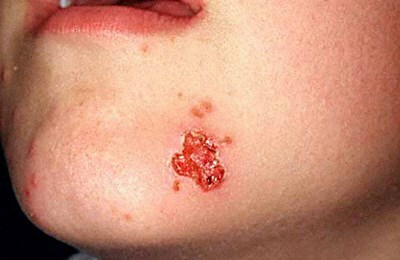 Though the oozing and scabbing stages are most likely to cause spreading, the herpes simplex virus is contagious even before a blister fully shows up. Early cold sore signs include tingling and itching around the affected area. If you’re experiencing those symptoms around your lips or mouth, avoid touching that area. If you do touch the area at any point, be sure to wash your hands. Because people aren’t used to cold sores on their chin, it’s easy to confuse them with other conditions or growths. The most commonly mistaken condition is a pimple. Pimples can occur on the chin and other areas of the face frequently. However, there are a few key differences to note. Knowing these differences can allow you to be sure whether you’re dealing with a cold sore. Pimples are caused by clogged hair follicles on the skin. They may even have a white or black ‘head.’ They cannot occur on the lip since there are no hair follicles there. They may start out as a small red dot, similar to how a cold sore begins. However, that is where the similarities end. A cold sore can grow on the lip line. It’s likely you may have recently experienced a cold sore on the mouth before noticing a spot on your chin. Cold sores won’t have a head of any kind and will go from a red area to a blister. That blister will begin to ooze, and then crust over to start healing. Pimples can be treated in different ways, and if you touch one, it will not spread it to other areas of the body. Some people even squeeze or pick at their pimples. This may cause mild irritation but usually, doesn’t cause harm. If you pick at a cold sore during any stage, you can spread it to other areas. You also run the risk of it becoming infected or bleeding. Finally, these two conditions require very different treatment solutions. While both will go away on their own, treatment is important in finding relief from embarrassment, or even pain if you’re dealing with a cold sore. Treating a blister on your chin as soon as possible is key. The sooner you begin treatment, the sooner you’ll experience relief. It may also speed up the healing time. However, one of your biggest concerns might be concealing the blister. A cold sore on the chin can be embarrassing and easily noticeable. Thankfully, there are some treatments that heal the blister while helping to conceal it. One of the most popular options is the Abreva invisible cold sore patch. This patch allows you to cover up the cold sore immediately. There is no medication involved, so it will not heal the blister. However, if you need to conceal it for a short time, this allows you to do so effectively. You can also apply makeup over the patch without risk. Another concealing patch that does contain medication is the Compeed Invisible Cold Sore Patch. It helps to cover up the blister while reducing symptoms and speeding up healing. You simply apply the patch directly to the blister for a few seconds until it adheres securely. You should never put makeup on to cover up a cold sore on the chin unless you use a patch to conceal it first. The chemicals in cosmetic products could irritate the blister even more and could cause infection. If you’re more concerned about getting rid of the blister quickly, rather than hiding it, you should choose a fast-acting treatment solution. Because cold sores are so common, there are dozens of options to choose from. Use it at the first sign of a cold sore to not only alleviate symptoms but shorten the time it takes to heal. It is specially formulated to soothe even the toughest symptoms. With more people turning toward natural treatments, HERP-B-GONE Cream is a formula you can feel safe using. Unless you are allergic to one of the ingredients, it’s unlikely you will experience any negative side effects from using it regularly. It’s also important to know what triggers a cold sore for you. Flare-ups can be caused by anything from stress to weather conditions. Being able to reduce your risk of a flare-up can not only limit how often they happen but the severity of the blisters themselves. If you’re prone to outbreaks, do what you can to determine what typically causes them. Then, you can take action to reduce those triggers. Treating a cold sore on the chin is no different from treating it anywhere else. It may be more embarrassing for some people. You may be more tempted to hide a cold sore. But when it comes to the treatment, the strategy should be the same. Once you’ve determined that the growth on your chin is a cold sore and not something else, find a treatment option that works for you. Some over-the-counter treatments claim to work in as little as 24 hours. There are also dozens of home remedies you can try to alleviate pain and itching. If you experience a cold sore on the chin, or anywhere else on the face, understand that it probably occurred because of spreading. Taking extra precautions to keep blisters isolated is important. Fever blisters can be painful and ugly no matter where they are, so do what you can to make sure they can’t spread elsewhere on your skin.